I only have 1 set. Where is a good place to get a set done? Who have you purchased key blanks from ? I see several on ebay. Is there a Pantera vender that sells them ? My door key looks to have the 4 number code on it. The ignition key not sure as one side says Ford the other has four letters not sure if that's the code. I went to an "old school" locksmith in town that looked at the blanks, knew what they were, and pulled them off his rack. I think he mentioned they were from a Jaguar. Home Depot will not be able to do that! Call around town, you may get lucky. My BIGGEST problem is I research BUT don't finish nor make notes. Find and old locksmith shop around town. If you are lucky, they'll have key blanks for old English and Italian cars. 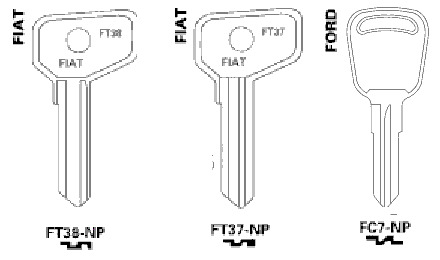 The ignition key is for a 70's Capri and the door/trunk key is for a Fiat. The door/trunk spare key I have is from Taylor and the key code they use is FT9-3 which cross references to Ilco's FT38 (I think). You're other option is to buy it off eBay but you'll still have to find a shop who is willing to cut your blanks. Good luck. Not many old time lock smith shops around anymore but I know one still open about 20 miles away its worth a call. Dominic, one of the real problems with many Pantera keys is, 43 years of wear leaves the brass keys themselves rather badly worn- along with the locks themselves. So a new copy made from what you have may or may not work in your locks. That's another reason to take the whole car to a lock-smith, who will not only make you new keys, he will try them in your locks and make minor changes so they actually are useful. This could save several back-and-forth trips and some bad feelings. Just a thought.